OxForm Studio brings countless resources of reclaimed lumber, metal, hardware and true craftsmanship to each and every installation. Through Whole Foods Market's passion and mission to promote local and sustainable lifestyles, we have been able to partner with them on many of their new locations. Our first collaboration in Savannah, Georgia, we were able to utilize local non-profit, Design for Ability, and 3 of their special populations high school students enrolled in their vocational training program. Materials for this project included: salvaged heart pine, maple bowling alley lanes from Southern Pine Company, upcycled pallettes from DIRTT Savannah and reclaimed pine. See More of Savannah WFM here! This project included a playful bartop that curved out at 25 feet long. 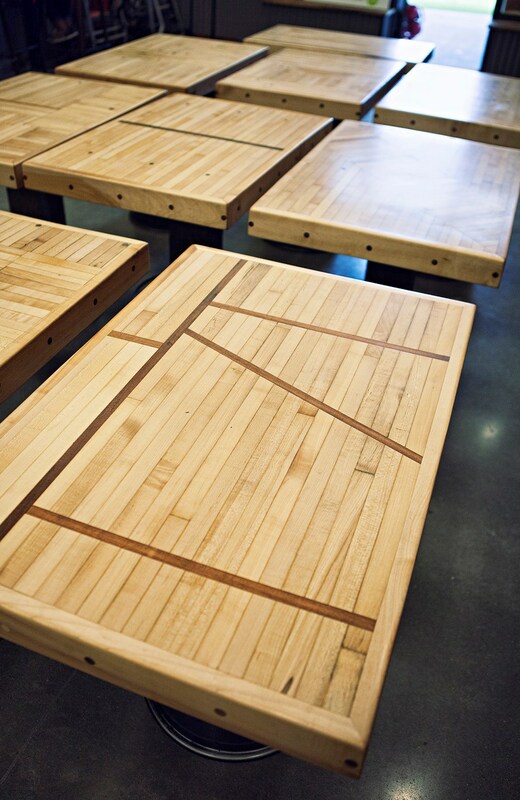 Salvaged end grain cuts of heart pine set the starburst pattern into play, while utilizing heart pine locally sourced from Ken Russell in Metter, GA.
Another coastal WFM location called for a custom mix driftwood finish technique that can be found on the larger dining tables. 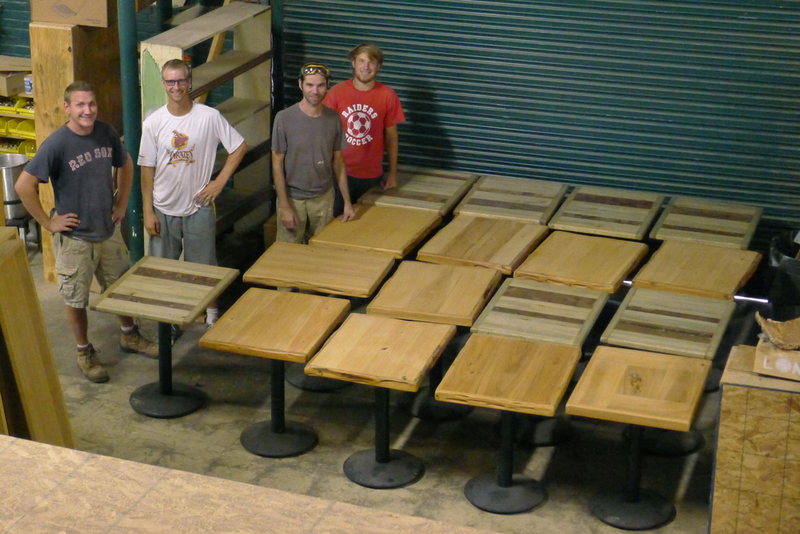 The exterior, 2 top tables were constructed with locally milled cypress planks and the pecky parts were added to the edge banding. All of the liner inlay mosaics were aged with a black resin finish, which contrasts next to the grayed reclaimed pine planks. Special thanks to this beach side community for including our work in your new WFM! See more hilton head WFM here! The mountain town of Asheville holds a special place in everyone's heart. So we wanted to bring a little of historic Savannah to the new WFM and incorporated reclaimed pine plaster lathe pulled straight out of a historic home. This design detail of inlay scraps is reminiscent of a herringbone pattern and reflects the art deco architecture of Asheville. As always, we sourced locally, regionally and happily! Material sources: White Oak from Sunrise Sawmill in Asheville, NC; Reclaimed heart pine tongue and groove wall planks from Ken Russell in Metter, GA; Salvaged pine plaster lathe from Chad Cox in Savannah, GA.
See more Asheville WFM here!